The Awards Ceremony of Pakistan’s first-of-its-kind online learning contest was held in Islamabad to acknowledge the winning students and to encourage the use of technology in classrooms. The digital competition ‘Learn Smart Pakistan’ was organized by Knowledge Platform, Asia-Pacific’s leading innovation company that offers technology solutions for school s. The company endorses the use of innovative classroom technology to motivate learning and improves student achievement. Mr Ahsan Iqbal, Federal Minister for Planning, Development and Reform distributed awards among the winners of the learning challenge. Appreciating the digital challenge initiative, the Minister stressed the need for responding to the educational needs of Pakistan’s students with technology. A total of ten students, and four teachers were awarded prizes in four different categories – two for students and two for teachers. 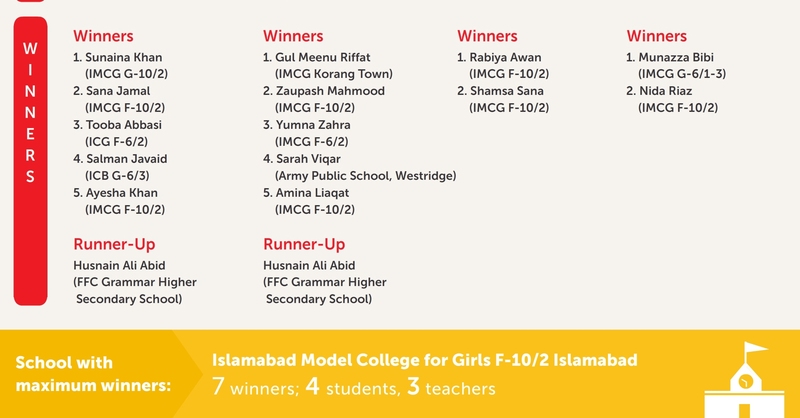 The best school shield, based on the number of winners of the online challenge, was awarded to the Islamabad Model College (IMCG), F-10/2. The winners of the ‘Highest Proficiency’ are: Sunaina Khan, Sana Jamal, Tooba Abbasi, Salman Javaid, Ayesha Khan and Husnain Ali Abid. While winnign students of ‘Greatest Online Effort’ include: Gul Meenu Riffat, Zaupash Mahmood, Yumna Zahra, Sarah Viqar, Amina Liaqat. The award for ‘Most helpful Teacher’ was won by Rabiya Awan and Shamsa Sana, both from IMCG F-10/2, for helping students achieve proficiency and demonstrating commitment to strengthen their online learning skills. Munazza Bibi and Nida Riaz were awarded the prize of Best Group Mentor. “Teachers who do not embrace technology are likely to be left behind” as Pakistan’s education providers are fast moving towards technology-supported modern teaching techniques, said Ms Sana, one of the winning teachers. The objective of the digital challenge is to introduce Pakistan’s students and teachers to a state-of-the-art online digital learning solution and to provide them a collaborative learning and teaching platform, explained Mehr Shah, Director of Knowledge Platform (Islamabad), speaking at the ceremony. Pakistan needs to embrace technology to respond to its education crisis, said Peter Coventry, Head of Aid at the Department of Foreign Affairs and Trade (DFAT), Australian High Commission. He also stressed that the country should focus on quality of education in addition to access. The challenge was held in summer of 2014, when 9th grade students and teachers were given completely free online access to the entire 9th grade Mathematics syllabus. 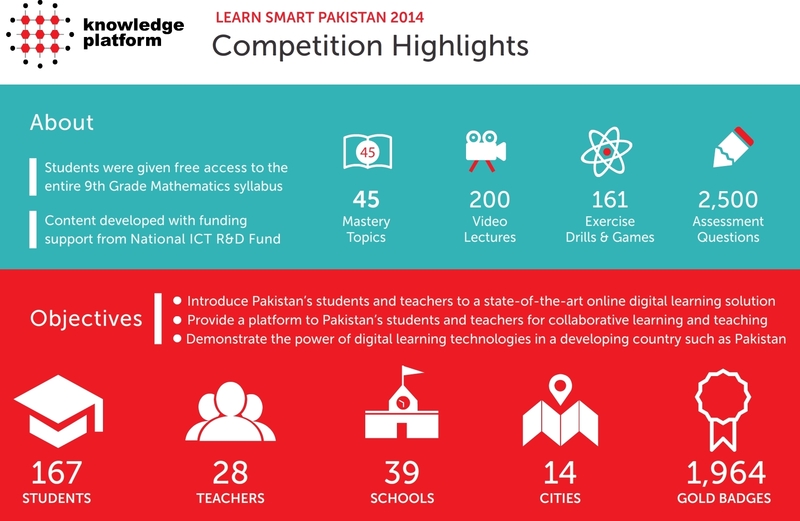 Students and teachers from 39 schools in 14 cities across Pakistan enrolled in Learn Smart Pakistan contest 2014 including smaller cities such as Kasur, Lakki Marwat, Kohat, Rahimyar Khan, and Gujranwala. The challenge content, which has been developed with support from the National ICT R&D Fund, included 200 video lectures, 160 exercise drills and 2,500 summative assessment questions and was based on the Federal Board syllabus. Yumna Zahra, student of 9th Grade at IMCG F-6/2, Islamabad, believes, “a class becomes very interesting when a teacher has at least one interactive activity for each lesson to keep us engaged.” Ms Gulmeena shared that the competition enabled her to study her entire mathematics syllabus during the summer holiday and engaged with peers and teachers through the social learning feature provided via the online system. The proceedings of the Award Ceremony included a presentation of Knowledge Platform’s learning solution, followed by two digital challenges to demonstrate the technology and concept. The first challenge was for selected students. The winner of the student hot seat competition was from Islamabad Model College for Girls, Korang Town in Islamabad. The second digital challenge was an audience-wide contest with the additional aim of raising awareness on Pakistan’s education emergency. The winners of the audience competition included Mr. Peter Coventry of DFAT and Mr. Sami Sadozai, an education expert. Knowledge Platform is one of Asia-Pacific’s leading instructional design, e-learning content development and learning technology solutions companies with offices in Singapore, Tokyo, Delhi and Islamabad.